It really should not be this difficult to figure out how to eat. Yet for many individuals, it is an ongoing struggle. Part of the problem is that food and eating have been driven more by media and marketing lately than research or common sense. To a large degree, many people associate food and eating with socializing or cravings, more so than with health. Too often food choices are made based on convenience, calories, colour, design and taste versus the nutritional value of the food. It is very rare to find a cooking show or any food advertisements that highlight the nutritional value of the food, and often when they do it is more marketing than it is fact. Food is the fuel for the body. It is the building block for every muscle, cell, tissue and fluid within the body. The saying "You are what you eat" is quite true. The social aspect of eating is important, yet I encourage you to make the nutritional value of food as the most important quality. To eat for health involves following the other 4-guidelines and it involves listening to your body. If a food causes you gas, bloating, acne, diarrhea or other physical symptoms, it is probably not the best thing for you to eat. One of the most common trends right now involves people avoiding a specific food group, such as grains, vegetables or fats. This is especially true for younger children who are fussy eaters. Every food group has its value and the different food groups are not interchangeable. required for structural component of cells and tissues, hormones, enzymes, immune system and basic building block of DNA. provide the body with the required vitamins and minerals, especially the minerals, which are required for every cellular function. include pears, apples, berries, grapes, bananas, oranges, etc. provide the body with the required vitamins and minerals, especially the vitamins, which are required for every cellular function. good sources include nuts, seed, fish, butter and plant-based oils such as avocado oil, coconut oil, olive oil. oils are essential for joint health, healthy skin, brain function and many other essential bodily functions. Snacks, if needed, should be focused on vegetables, nuts and seeds. As much as possible, avoid snacks, especially for children, that are mostly grains or sweets. You also require adequate water and the consumption of healthy fats and oils each day. There are some health conditions that may require a different ratio of the food groups. Your naturopathic doctor will tell you if you require different portions of the food groups. Eating regular meals is required to balance blood sugar, to sustain energy and to assist with metabolism. The body functions better when it can count on you eating on regular schedule. Keep the timing of your meals as consist as possible. It can vary within a week, i.e., you always eat late two nights of the week, but week-over-week, try and maintain a schedule that the body can rely on. Avoid "unconscious eating". You know, the snacking that happens when you are bored or reading. Many extra calories can be attributed to "unconscious eating". Stop eating at least two hours before bedtime. The body needs sufficient time to digest the food. Late eating and unconscious eating are probably the two biggest factors associated with weight gain. Eating late is also associated with insomnia, disrupted sleep and heartburn. Eat breakfast. Some people never eat breakfast and they seem to do just fine, but the majority of people will have more energy, will think better and will be more productive, if they eat breakfast AND if the breakfast is balanced (i.e,, has healthy grains, protein and fruit). For many reasons - weight, blood sugar, balance mood and nervous system, overall health - do NOT start or end your day with sugar. Ideally 75% of the food you consume should consist of whole foods. Whole foods include fresh fruits and vegetables, using the raw forms of grains and legumes (i.e., cooking rice from scratch) and choosing non-processed meat. Packaged food generally will contain more additives, more salt or more sugar- things you don't want! Local. Food that is locally grown will be fresher and will have higher nutritional value. 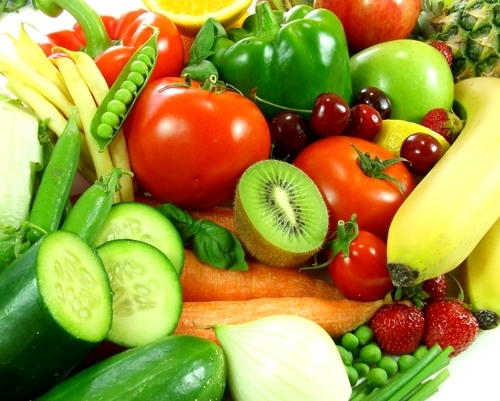 The nutritional value of fruits and vegetables decreases the longer the time between when the fruit and vegetables are picked/harvested and when they are consumed. Organic. Organic food will always have less pesticides and herbicides and will not have added hormones or antibiotics. There is a difference between healthy food and food that is healthy for you. Each person has their unique constitution and health concerns. If you are allergic or intolerant to any foods, you are best to avoid them. If you are unsure of the foods that you react to, ask your naturopathic doctor for a blood test to determine the foods your body reacts to. Check out our website for a number of additional handouts on food and healthy eating. Including handouts on acid-alkaline diet, energetic properties of foods, food introduction schedules for infants, and many others. As part of our Guide to Health Series, we will be offering in-house seminars on each topic. If you are unable to attend our seminars, we will be providing video highlights of some of the seminars on our website. If you have any questions about nutrition that you would like us to address, please contact us at info@naturopathicfoundations.ca.